Mrs. Kanchan Chellani, one of our math teachers here at NMHS, is very enthusiastic and creative. To engage students in her classroom, she has developed an interactive, student-centered learning environment. Through the use of technology, collaborative learning, and teaching mathematical concepts in the real-world and interdisciplinary context, she has managed to successfully work towards creating this desired positive and energetic blended learning environment. Some of the many methods Mrs. Chellani has employed in her daily instruction include integrating Smart Board interactive review games and videos to reinforce prior learning, case studies performed in the computer lab so students understand the significance of the material taught, and team assignments to foster a collaborative working environment. Since the “flipped” approach to instruction has been a hot topic in modern education, especially at NMHS, one of Mrs. Chellani’s recent initiatives has been to integrate Edmodo into her daily lessons. She searches on the Internet for videos on the relevant content, posts them on Edmodo for her students to view, and creates polls (guided practice problems) for her students to complete in order to foster discussion on the topic the next day. Although Edmodo and the “flipped” approach to instruction has transformed the way material is taught and comprehended by students, Mrs. Chellani noticed that it is very difficult to find videos on the content that are truly engaging. As a result, she has decided to create her own video content using the software Adobe Captivate. Adobe Captivate is a highly, user-friendly digital content creation software that fosters interactive eLearning content. Mrs. Chellani refers to Adobe Captivate as a “PowerPoint on Wheels.” In other words, this software not only allows one to either import or directly create a PowerPoint presentation to illustrate content, but it also provides many features that transform a simple presentation into something engaging, interactive, and stimulating. Some of these features include integrating background music, voice-overs, the timing to which the content is displayed, videos, screen captures/simulations, and formal assessments such as quizzes that automatically track results. Through research and the aforementioned features that the software offers, Mrs. Chellani came to the conclusion that this is one of the best tools to create digital eLearning content that would support the “flipped” approach to instruction. She has made use of the tool to create learning modules that teach the basic mathematical concepts, provide practice problems, real-world examples, and assessments that allow for better comprehension of the material in an organized fashion. In these learning modules, instruction is provided using digital content, simulations, videos, screen captures, voice-overs, etc. to meet the visual, auditory, and tactile needs of the diverse student population. Once the instruction has been provided, guided practice problems and real-world examples are then discussed to reinforce the learning of the mathematical concept and to illustrate its significance. A variety of prompts and formal assessments are also embedded within the project in order to ensure learning has taken place, to foster higher-order thinking skills, and to facilitate discussion in the classroom. Using Adobe Captivate, Mrs. Chellani has been able to create an engaging experience for her students that not only helps them understand complex mathematical concepts, but also helps them understand the real-world significance of those concepts. Eric, thanks for this post and for the several that are linked to it. So many good ideas. Wonderful timing, too! As you may have read, I'm creating a brand new experience for my K-4 Computer Lab students next year; we are embracing student inquiry and turning my class into the "K4STEMLAB"! See: http://bit.ly/stemlab. Flipped/blended learning is going to feature prominently in it. 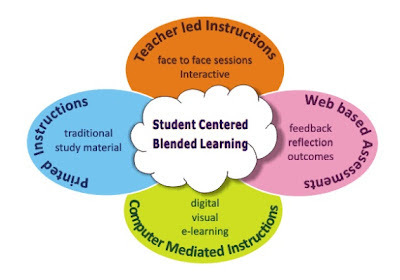 My research into the implications for flipped/blended learning for elementary students is just beginning but I'm very excited. Given the amount of videos kids consume from very early ages, I am convinced this model has value. That said, I love that the blended approach Mrs. Chellani uses also relies on paper, as we will need to do some of that, too. Exciting times ahead ... thanks for cultivating educational innovators at NHMS ... we're all benefiting from your leadership. Eric - Thanks for sharing your thoughts on flipped classes. Flipped classes are definitely one of the hot topics in education. There are many tools to help teachers create and distribute their video lessons. You might want to check out http://www.StudyHelpSite.net as a way for teachers to organize there classes. One feature of this web tool is the lesson upload that allows teachers to upload video lessons and attach them to assignments.